I have an emotional relationship with Fedora as it was the first Linux distribution I ever used. 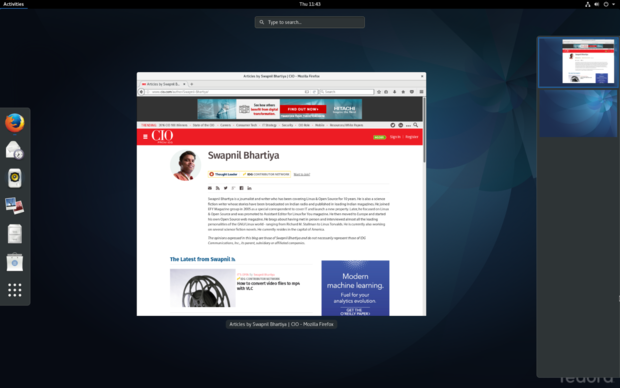 But now it's also becoming my favorite desktop Linux distribution. Despite being my gateway to the Linux world, I have not been a Fedora user. I have extensively used Debian, Ubuntu, openSUSE and Arch Linux. I avoided Fedora for a very long time because my Fedora machines never survived updates. Eventually I gave up on it. Things changed with version 19 and now Fedora works flawlessly. In fact it exceeds my expectations. I recently bought a Brother printer and my most beloved distribution openSUSE refused to detect and work with it. It worked with every single distribution including Fedora but not with openSUSE. openSUSE Gnome was running on my Dell XPS 13 machine and I had to wipe it off and install Fedora on that machine because I needed something that worked with my printer. It was a sad day. I think there are two kinds of use cases: desktop system and servers. On servers you want very well tested and stable packages because you don’t want your entire infrastructure to go down and end up losing millions of dollars in business. That’s why people use older, very well tested packages. But consumer desktop is a totally different story. That’s where I want new features and the latest packages. I am primarily an Arch Linux user, but a majority of applications that I use in Arch are from AUR (Arch User Repositories) and these are the ones that often break. I keep a backup OS on the same machine, just in case. It used to be openSUSE but Fedora is fighting hard for that spot. One of the critical factors was support for my printer. Second being that Fedora does offer the latest version of applications without having to fiddle with repositories or by adding unstable repos. The best thing about Fedora is that not only does it work upstream, but in many cases it is the breeding ground for many Linux related projects. Fedora is the upstream for Red Hat Enterprise Linux. And things keep getting better. The Fedora community released beta of Fedora 25 this week and I am already running it on my Dell XPS 13. I love it. The most interesting feature of Fedora 25 is the official debut of the Wayland display server that replaces the legacy X11 server. What I love most about Fedora is that they work closely with the Gnome community. With Fedora 25 you get to try Gnome 3.22 which comes with many interesting features, including one feature that I have been bugging the Gnome community about for a very long time: batch file renaming. As an amateur photographer I take a lot of pictures. While covering events like LinuxCon or OpenStack Summit, I end up with thousands of photos taken during different days during different sessions. I want to be able to select those 20 images that I took from the keynote of Linus Torvalds and batch-rename them accordingly. That was not possible under Gnome. You had to rename each image individually. Another interesting feature of Fedora 25 is the arrival of improved Flatpack support. Flatpak, in my opinion is the most needed solution in the desktop Linux world. For those who don’t know, Flatpack is a distro agnostic application packaging and delivery format that allows developers to offers their apps to desktop Linux users without having to worry about the distribution. It also removes the unnecessary delay that comes with distro maintainers taking their time to test applications before offering them to users. As a result, while I can get LibreOffice on macOS and Windows on the same day of release, openSUSE can take up to a week or even more to offer that version in the stable repository. With Flatpak, you can install it the moment LibreOffice community makes it available. If you are still not convinced that you should give Fedora a try, You should know thatthen let me tell you that Linus Torvalds, the father of Linux himself uses Fedora mostly because of the great work Fedora developers do and also because of the latest packages. Fedora is also seen as a great platform for DevOps. Go ahead and give Fedora 25 beta a try.